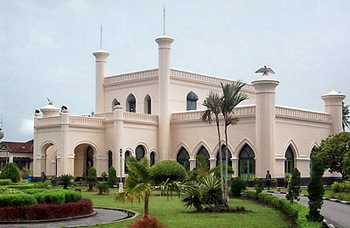 Sultan Syarif Hasyim Abdul Jalil Syarifuddin built this Moorish style palace of Siak Sultan, 120 km up stream from Pekanbaru on Siak River, in 1889. Now a museum, the palace contains sultanate’s royal paraphernalia and other items of historical interest. Established during the 16th century, Siak Sri Inderapura sultanate lasted until 1946, when it became victim to the popular upheavals following the Japanese surrender at the close of World War II.